The Lewes Road Congregatonal Church Hall was one of those places never to forget. I remember it from the time we used to stage our pantomimes there. There were lovely old wood floors everywhere. We had end of season parties in the stage hall with questionnaires all around the walls. There were lots of ridiculous team games and plenty of dancing. Ballroom of course! We are still in the 50’s and early 60’s here. Possibly Alladin pantomime: Some names I can recall are; Left to Right; Front row; David, Susan, Valerie, Adrian Ball. Meryl (my best friend), Hillary, Barbara, Michael, Margaret, Janice. Back Row. Sandra Baldwin-me), Sheila, Anne, (? ), (? ), (? ), (? ), Mary Triggs, (? ), Brother of Mary Triggs, (? ), (? ), (? ), Ann. Adjacent to the stage hall was the canteen with it’s big urn for brewing large amounts of water for teas. Extra padded doors were added to the canteen hatch-way whilst we were brewing up teas when shows were on. I can remember whispering all the time and moving the crockery and cutlery around carefully and quietly. I also helped out in the kitchen on rehearsal nights for the Gilbert & Sullivan singers. Teas with cucumber, cress or egg sandwiches were served at 9 pm precisely. They all would thunder down the wooden stairs thirsty after all that singing. Something like one shilling and sixpence covered tea and a sandwich, and it was dropped into a little white pot. Then the company resumed rehearsals, also on the top floor school room, till 10pm when lights were dimmed, and flashed, to let us all know time was up and the caretaker wished to lock up go home on time.Percy was the caretaker’s name. I believe he lived just round the corner in upper Lewes Road so he had not far to walk. The dark walls and corridors of the church hall were full of memories and sounds of all kinds even though no-one was there. This was alright in the light summer nights but dark winter evenings it could be spooky. For the pantomimes Florrie Richardson was our producer. A very sweet shy lady who I am sure had quite a job each year putting us though our paces. We rehearsed in one of the school rooms up on the top floor above the big hall at the front of the building. I feel certain Florrie had an assistant but I can’t recall who that was. Neither can I remember who played piano for us and all those lovely songs from the West End shows. It always seemed to come right on the night. Thank you, Florrie. A pantomime which definitely had something to do with King Neptune ??? 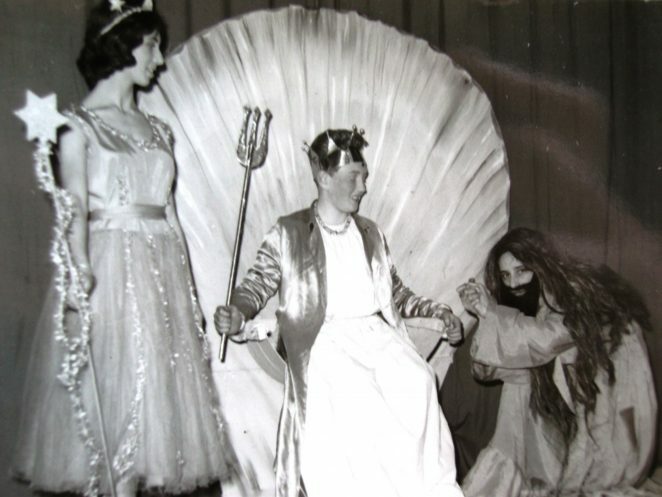 Myself as Fairy, Richard Bills on the shell throne, and Martin Surman clearly begging for forgiveness of some kind of misdeed. Thanks to Grannie, I have been reminded of two mistakes in my naming of the girls. The last two girls on the right of the front row are Marion Joiner,(not Margaret), and Janet on the end, (not Janice). Also next to Mary Triggs it looks like one of the George sisters. Grannie thinks probably Barbara? Thanks Grannie. Hey Martyn, Great to see your response. Still alive to tell the tale – makes me wonder about dear Richard and his whereabouts. It rather looks like the photo was a planned event, probably dress rehearsal night, because we all look rather pleased with ourselves. I am certain your begging position meant that Richard should have more of a frown on. And I…..well…….not sure what my role was any more. Maybe they should have snapped us when the show was in full action for the real mood of things. Thank you for participating in this web adventure. Greetings, Sandra. Hi everyone, my big sister Anne (Fowler) is in the top photo, 3rd from left, back row. My mother played the piano for the Operatic Society and pantomimes; I used to sit and turn the music pages for her. I recognise many of the faces and names – great to revive many memories. My big brother Tony was in the 13th Brighton as was I. We are all alive and doing okay despite life’s attempts to knock us back. Hello Geoff. Although this was all very many moons ago I am pretty certain Sheila’s surname was Robbins. And maybe we can find it on another page on site somewhere. Till then, best wishes. Thanks Sandra, Sheila has now seen the photo, she remembers being in a few panto’s there (and some of the names mentioned) but can’t remember this one – she does however think that it could well be her next to you. As you allude, many years do dim all our memories somewhat! That’s one of the good things about this site – the collective memories shared to record events, people & places for the future. BINGO! Hunting through the photo’s I inherited from my late mother I came across a photo of 4 girls, including my sister Sheila, in costume. Lo & behold, all 4 appear in the same costumes in this photo – the cover of the photo is annotated in Sheila’s writing “Little Goose Girl 1960 panto 4 maids Spanish, Dutch, Scotch, Irish”. You (Sandra) were the Scotch girl and the Spanish & Dutch girls can be seen at the extreme right hand ends of the front and rear rows. The backdrop is the same as well so I would be very surprised if the 2 photos were of different events. I also have cast photos of other pantoss as well – Pied Piper in 1956, Old King Cole in 1958, and Sinbad the Sailor in 1961. I forgot to add – the second photo above would appear to be Sinbad the Sailor from 1961 – I can find all 3 of the characters in the cast. Hallo Geoff, Funny you mention the Scottish outfit I am wearing as I now live in Scotland. Sinbad the Sailor, as you have named it, was probably my last Panto as that was the year I started work and had a regular boyfriend so my attentions were elsewhere by then. Would be great to see the other photos you speak of if you feel like sharing them on this site. Greetings, Sandra. Hi Sandra; more than happy to add them to the site but they might be best placed on this page rather than start another thread for each of them. Perhaps one of the Ed’s could advise the best approach? Hi everyone, its Sally Feest here. The young girl in the pantomime photos who you only ever remember as Valerie was my step-sister Valerie Reeves who unfortunately is no longer with us. I was in the Maids Brigade myself and remember a lot of people from those days. Happy days and memories.